Since 1996, members of the American Holistic Veterinary Medical Association have been using Myristin® for horses, dogs, cats, and other animals. 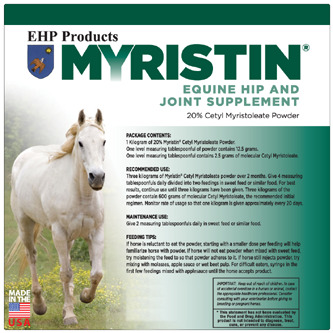 Horses require three kilograms of our Myristin® Equine Hip & Joint Formula 20% cetyl myristoleate (CMO) powder for a three month usage program. The powder is mixed in with any kind of sweet feed, oats, etc. in one or two daily feedings.